One of the things I missed most about living away from Virginia (1987 to 1997) was summers roadside bloomery–the assortment of truly-wild flowers that North Carolina attempted, appreciably, to reproduce along their hiways, and in most cases failed by my reckoning. Now I’m sure there are beautiful roadsides in every state (most, at least) but it was southwest Virginia’s I longed for. So this time of year, I remember that longing to drive slowly down a rural Virginia back road, the edges high with blue chickory, white Queen Anne’s Lace, golden Black Eyed Susan, fushia and white Sweet Pea, Chrysanthemum, Knapweed, and all the rest. I carried my camera with me on a recent honey-do run to the Check (Virginia) post office. Pictured, one of the two stop signs in the six-mile trip up Shawsville Pike, along Daniels Run, and Locust Grove to “downtown Check” (the store and the Post Office–that gives an all new meaning to the phrase ‘the check is in the mail’). 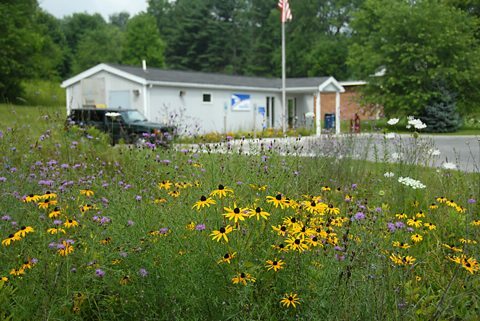 After spending big shipping bucks to send homemade cookies to a child or other relative half way across the continent as instructed, I spent some personal R & R photo-time in the field next to the post office, populated predominantly by Black Eyed Susan (Rudbeckia sp) and Spotted Knap Weed (Centaurea sp), the former, one of my favorites, the latter (a relative of the more comely Blue Cornflower) is considered an invasive. Last summer, I wrote along the same lines (America’s Roadside Bloomery) and set up a gallery for submissions. Didn’t get so many. If you send them along, I’ll add a few more. Tell where the shot is from, identify the general location (state, at least) the flowers if possible and whatever photo credits (name etc) you’d prefer. Email address is above my picture, right side bar. As a loyal North Carolinian, Fred, I feel compelled here to defend North Carolina’s roadside honor. 🙂 We have most of the flowers you listed blooming by the roadside where I live. The other day, it took my breath away to see a natural roadside display of red bee balm, Joe Pye weed, Queen Anne’s lace, chicory, and a late blooming of summer phlox. You should drive along the Blue Ridge Parkway up by Craggy Gardens sometime–the roadside bloomery is incredible, especially with the backdrop of blue mountains. Burke County (Morganton) NC where we lived for 7 years was not so richly blessed. And Alabama, my home state: nothing at all. And I know Richie Bell at UNC worked hard at reintroducing native plants to the interstate right of ways, but in such an un-natural setting, they never seemed very natural to me. So. 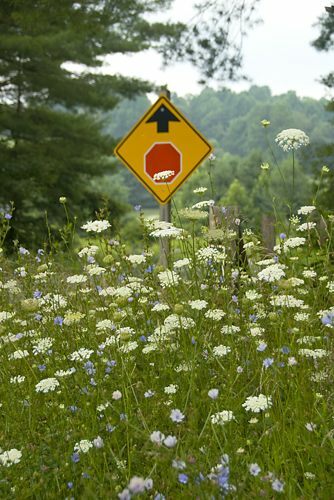 Send me a picture of wildflowers with a snippet of roadway in them, I’ll post to the bloomery gallery. I’d love to find crimson bee balm nearby–got a shot of it growing along a split rail fence many many years ago that was a long time favorite–lost somewhere on a faded 35 mm slide. What are the small bluish ones mixed in with the Queen Anne’s Lace? Those are the ones I most associate with your area. NC roads have had the most amazing display of poppies, lilies, cannas and daisies this summer! I’d send a picture, but our roadside flowers in AZ are gone by late April! Love that last shot Fred! Possibly a new shot for a summer notecard series??? ?